The old aircraft of the 1950’s and on through the following Decades, and now even to the next Century. The finest aircraft restored to their full glory for your pleasure, Fly-By’s and Air-shows. Travel round the globe flying the marvellous war planes. Battle Of Britain, possibly the finest Flight Simulation of this stunning action packed addon of the old days of war. The pack includes 11 fine aircraft, an airport with full decorations, and many more features for you to fly and enjoy. After ripping of the packaging and placing the CD-ROM in the drive I watch as it loads a Great movie JustFlight have placed on the CD. But away from that we go to the installation, simple as turning on your PC. Now to Fly! Loading up Flight Simulator 2002 I read the handbook provided with this package, with full colour pictures, explanations, and even pictures of the people who used to fly these aircraft before you. The booklet gives you full colour pictures of the Aircraft and their Panels. All these have a detailed key of what each button does. I now go to choose the aircraft where they are all automatically listed in my Aircraft List with their makers and full Details for you to read. Then we choose the addon airport with this package ‘ RAF Coningsby AB ‘ and wait for it to load. Then it appears, with fully realistic sound, and maybe it’s stupid, but at first I really thought it was a real life movie, then it hit me, it’s only the game. Anyway, I have a quick swirl round the aircraft and view the amazing details that are added to each aircraft, even down to their own Tail Number, which is specially designed. Then open the throttle and away we go, pounding down the runway with such force and then…….. Read on to see this products full features. All these aircraft total up to 11 amazing aircraft with fully working Dials, Lights, Flaps, Engines, Elevators and Ailerons with Rudder and a lot, lot more. The aircraft have the actual markings of the planes from the War, even down to the colour. Each plane has its own skill level. Each panel is fully detailed, and if you need any help just read the manual which includes fully colour illustrations explaining what each button does! Once inside the cockpit the panel and sound really give you the feeling of what it must have been like to be a pilot on one of these aircraft. With views in every angle you can look out of every window of these planes. At night these panels are fully illuminated to bring you the full effects needed to enjoy these planes! Each panel of every plane is designed in every little detail, including lights, sounds movements and every panel has its own Radio Stack, Throttle Quadrant, GPS and Compass. Some panels depending on the plane even have a button or switch to open the bomb doors on the plane, Marvellous. Looking around these panels I found no faults at all. Each Plane has its own sound. Just like any real life plane, you can tell the difference in the sounds of the planes. Whatever view, Spot, Cockpit or Tower you will see and hear this plane. Not only does the plane stick out but with the other aircraft sounds around you, I can admit only 1 stands out. Once inside the plane, and start the engines I cannot get to grips with how real the sound from inside really does sound so real. Flaps, Gear, Bomb Doors, Switches all have their own sound which stand out. Ultimately great sound effects! Battle Of Britain Memorial Flight, gives you the ultimate experience of being a pilot in one of the amazing 11 aircraft. If anyone is looking for a realistic War addon for the Flight Simulator I highly recommend this product. With full real Sound, Graphics and handling of all aircraft! If you are an owner of Combat Flight Simulator 2, then you are able to play with this addon in that. Not only that but ONLY in CFS2 you are able to have real time shoot up’s with over 25 historical missions. And for only £24.99 a product that is well worth buying in my opinion. 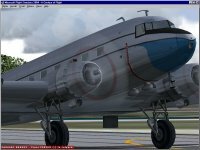 Great addon JustFlight. FSPlanet Rating 9.5 out of 10!